Note: This is the first of four posts detailing the non-marketing uses of SMS messaging for various types of organizations. It’s no secret that home and business owners hate dealing with general contractors, and given their routine 20 to 30 percent markups on gross job costs and general reputation for failing to stick to schedules, it’s no wonder. Some industry sources claim that consumers would rather do business with used-car salesmen than GCs. So any general contractor trying to make a name for himself has as uphill climb ahead of him, even if he’s as honest as Mother Teresa and as industrious as Benjamin Franklin. Fortunately, general contractors don’t have to rely on advertising or word of mouth alone to connect with customers and ensure their satisfaction. Judicious use of SMS messaging can benefit both without ever resorting to what we think of as a marketing message. Homeowners and others in need of construction services typically dislike three things about general contractors, namely 1) verifying GCs’ reputations; 2) delays; and 3) cost overruns. Fortunately, GCs can mitigate such factors with a carefully constructed SMS system. Take, for instance, the first factor. Rather than hoping that customers conclude they’re reliable, general contractors can message to them corroborating material such as licensing information, prior references, Better Business Bureau ratings, and links to consumer-rating groups such as Angie’s List. SMS messaging can also help everyone stay on-task after contracts get signed. Consumers aren’t the only ones who hate getting behind schedule. According to a survey conducted by Intuit, some 31 percent of contractors find scheduling subcontractors to be the most frustrating part of their business. One of the ways to keep such aggravations from boiling over into the client’s space is to regularly communicate, but doing so often eats up a GC’s time. However, SMS can automate quite a bit of client contact, alerting them to the arrival of materials shipments and stating when subs have shown up on site. GCs can even set up a daily checklist of tasks that they can push out, indicating what was done when as well as the overall scope of the work. Though such a buffer is surely overkill on anything but the largest endeavors, even small jobs often require more time and money than initially estimated. 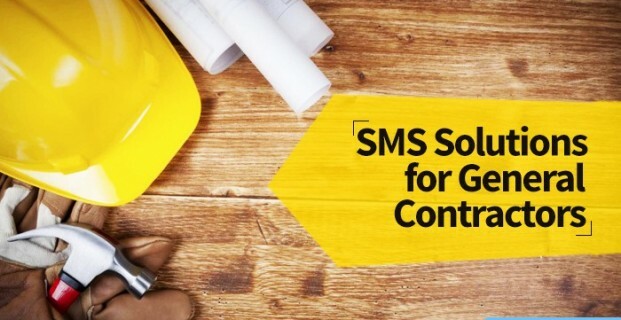 With an SMS system in place, general contractors can push pictures of areas needing extra attention, send revised quotes, and use the aforementioned checklist to make clients aware of workflow changes. In the end, contractors needn’t face unwarranted skepticism. SMS messaging can make communication as clear as clear can be.